I admit it. I'm a piler. My organization system involves stacks and piles -- flat surfaces everywhere covered with papers and clutter. If I’m expecting company, I just throw all those paper piles into a clothes basket and hide it in the closet to be sorted at another time. You know Peter Walsh, the organization expert from TLC's Clean Sweep and Oprah? He would be appalled at my piles and rightfully so. If you are organizationally challenged like me, you may want to check out Peter Walsh’s new Office Max line of organizational products called [In]Place System available in stores now. Maybe this spring you can incorporate a little organization into your life. Thanks to Office Max, I can start fresh with my office organization. I recently had the privilege to watch a webcast featuring Office Max’s Julie Kruger and Peter Walsh about the [In]Place System and also try out some of the products. What did I learn from the [In]Place webcast? 1) When looking for organizational products, look for those that feature direct access and portability. 2) Kids need routines and limits. Your kids will pick up on your organizational habits. YIKES! Foster good habits early on, be an organizational role model and have a place for them to put their papers. 3) Stop the “later” mentality. Peter used an interesting analogy of a washing machine. Would you start your laundry and then stop it in mid-cycle? You'd end up with a moldy mess. You need to finish the cycle. That means no later file. Do filing immediately. 4) Here’s one last useful tidbit: 80% of what ends up in your filing cabinet you never access again. You need to go through and purge documents at least once every six months. My favorite product so far? The see-through, portable DESKTOP SORTER. So handy in keeping current files at your fingertips and accessible. 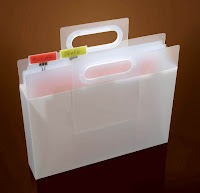 Another cool feature - all the transparent [In]Place folders can be used with erasable markers. Talk about clean sweep to a clean slate! I promise, as soon as I get my desk looking organized, I'll post a picture. Right now I have a little work to do! Peter Walsh has authored a few books you might want to look into if you need more organizational advice. I <3 but he could spend a few weeks at my house. I really wish I could just clean sweep my whole house and have someone put it all on my front and help me sort through it. AH, its so much work.